The latest production from Darlington Operatic Society is a step back in time to the simpler shows which relied on brilliant choreography, stunning costumes and wonderful dancing. Sure, the current hi-tech shows are fantastic entertainment; Shrek, Wicked, Harry Potter, Aladdin are great examples of blending cutting edge technology with stagecraft but sometimes the art of performing can be lost in the special effects. For the ever-impressive DOS’s Spring performance they have stepped right back to the 1930’s for the show that many argue is THE best example of musical comedy. 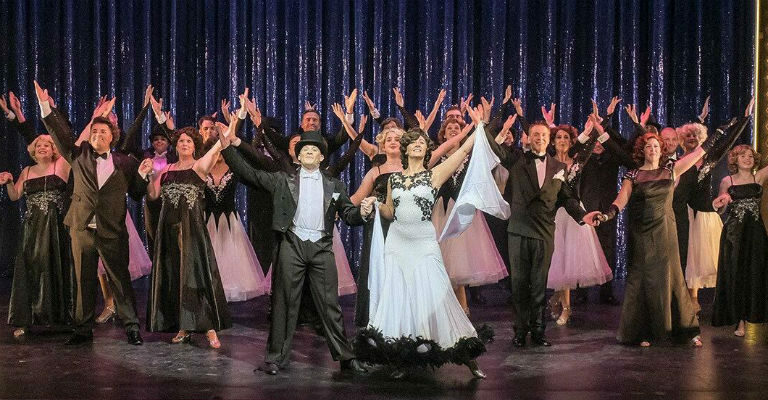 Backed by Irving Berlin’s instantly recognisable soundtrack, this production of Top Hat is guaranteed to send everyone away humming one of the classics having marvelled in some mesmerising dancing and breath taking costumes. 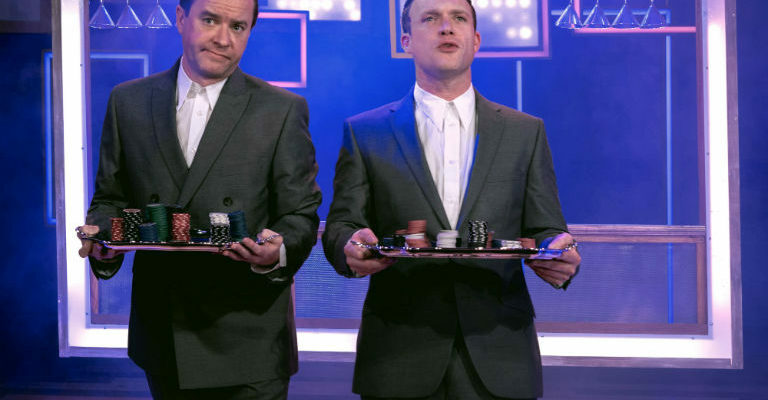 The story is a classic tale of mistaken identity descending into a screwball farce – Jerry Travers (the irrepressible Luke Oldfield in the Fred Astair role) is an American star who, whilst promoting a new show in London falls in love with Dale Tremont (DOS’s own Ginger Rodgers, Claire Monaghan). Through a series of unfortunate mistakes, Dale believes Jerry is actually his manager Horace Hardwick (Julian Cound in probably one of his best roles to date), recently married husband of Dale’s friend Madge (the ever youthful Samantha Morrison) . Whilst it might sound confusing, the constant interplay between these 4 draw you right in, setting up punchline and pratfall with perfect timing. Julian Cound’s comedy delivery, especially when trading verbal punches with stage wife Samantha in “Outside of that I love you” is perfection and illustrates that, despite the much held belief that Top Hat is first and foremost a musical, it is also a brilliant comedy in its own right. For anyone who has seen a DOS show over the past few years you will instantly recognise the craft and brilliance of Director and Choreographer Joanne Hand. Whether it is the intimate duet in Cheek to Cheek or the stage stomping tap ensemble in Top Hat, White Tie and Tails, Joanne gives the audience the chance to step back to the hayday of Fred Astair and marvel at the power of perfect timing. The depth of talent at DOS has never been in question, but seeing the ensemble rival Busby Berkley for coordinated tapping is very impressive. Ably complimented by Linda Sams as Wardrobe Manager, the glitz and glamour costumers add even more wow the to the show. Some would say that following modern productions of Sister Act, Legally Blonde, Spamalot, Priscilla and Chitty Chitty Bang Bang, taking a step back to a classic is a bold, if potentially risky, move which may lose some of the recently acquired, and perhaps younger DOS followers – to that I say poppycock – there is as much comedy, great songs, wonderful dancing and brilliant acting in Top Hat as will ever be seen in a newer more contemporary show and I urge anyone to go and be entertained.